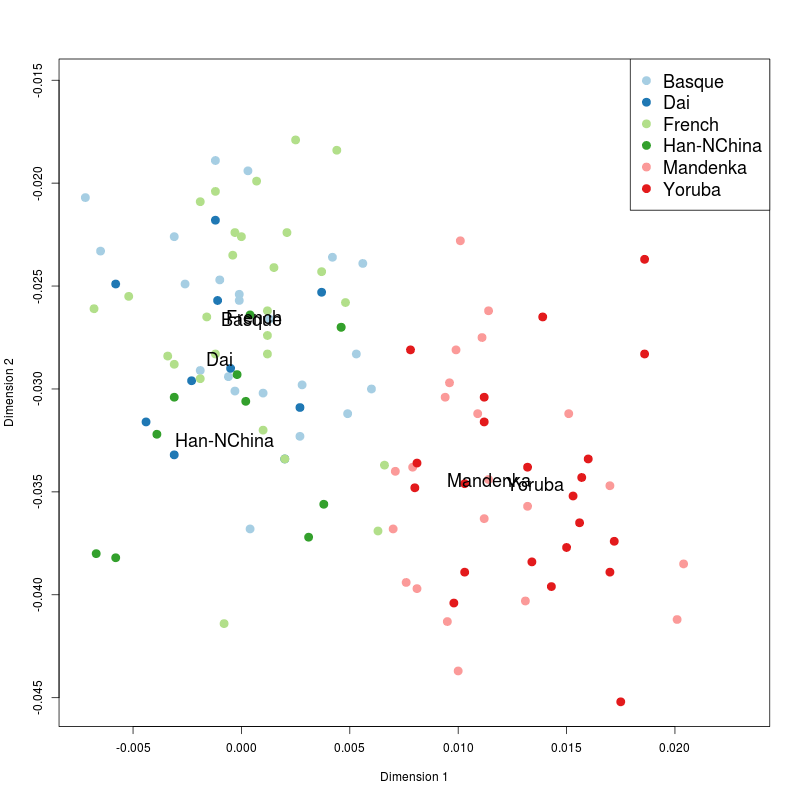 Dienekes’ Anthropology Blog: African population structure and/or Eurasian back-migration contribute to signal of "Neandertal admixture"
African population structure and/or Eurasian back-migration contribute to signal of "Neandertal admixture"
The recent Sankararaman et al. 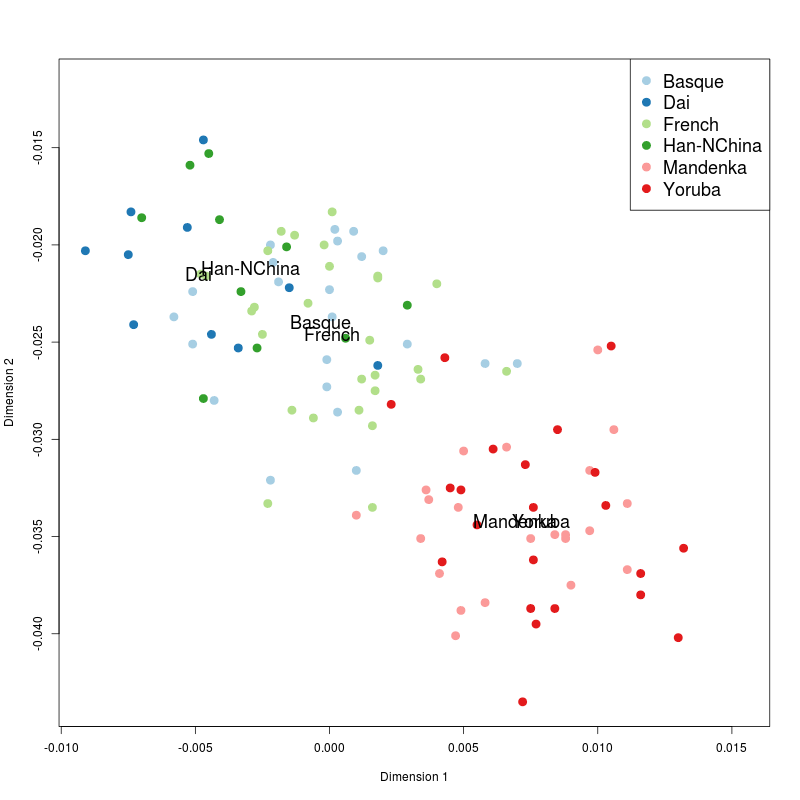 (2012) paper used SNPs that occur at a low frequency in modern French (minor allele frequency MAF less than 10%) to estimate the date of modern human-Neandertal admixture. 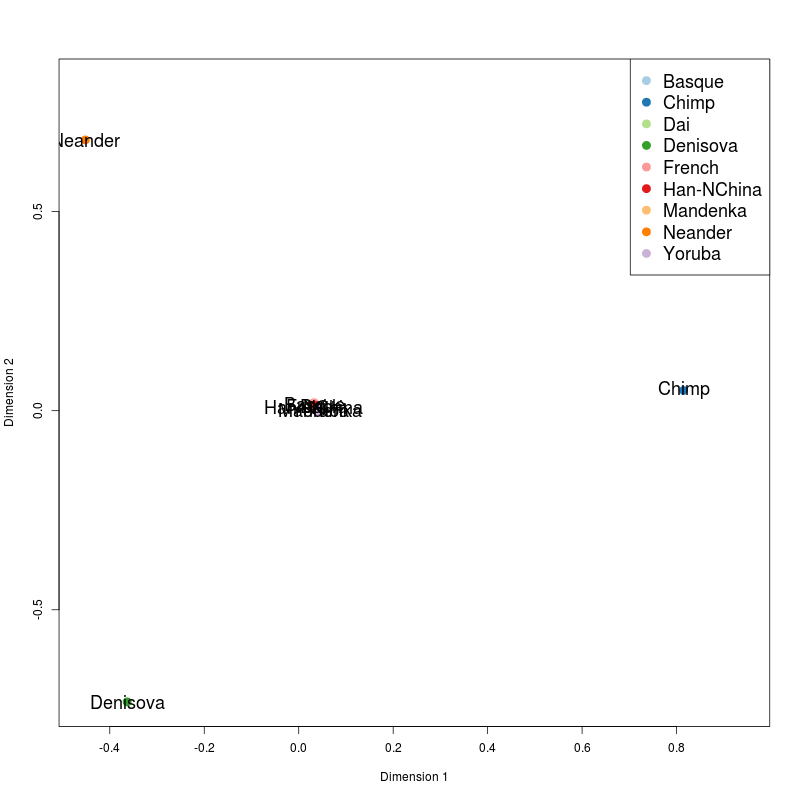 Presumably such low-frequency alleles have a higher chance of being inherited by Neandertals, and, indeed, the authors detect a stronger "Neandertal admixture" signal in this class of SNPs. But, does this justify a casual dismissal of African population structure as a contributing factor to the observed signal? To investigate this issue, I carried out a small experiment using the panel 4 (San-ascertainment) of the Harvard HGDP set. 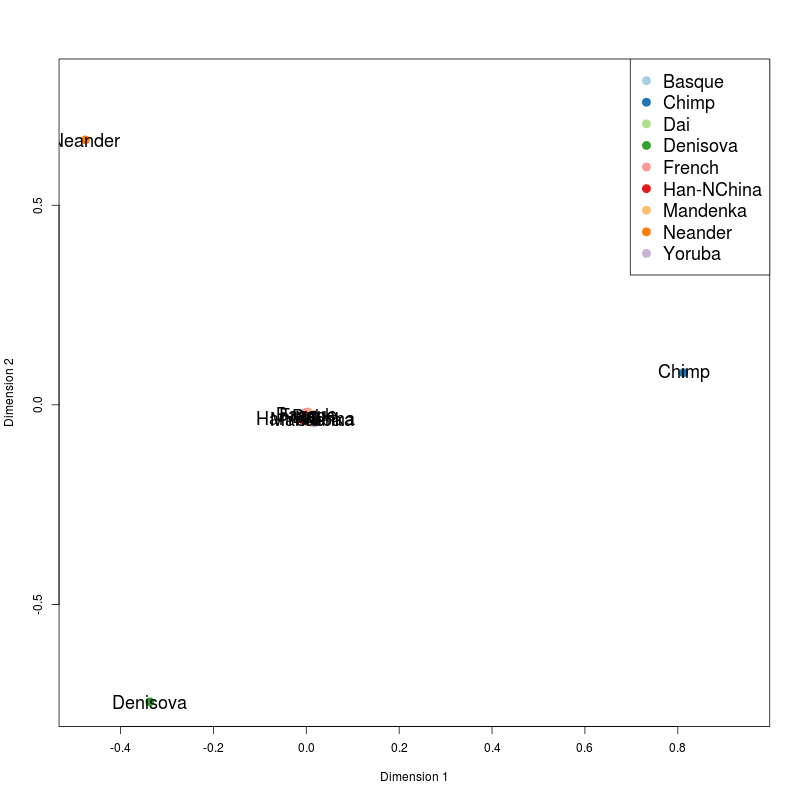 I used smartpca to do PCA using Neandertal/Denisova/Chimp, and projected a set of modern populations (Yoruba, Mandenka, French, Basque, Dai, Han-NChina) onto this PC space. 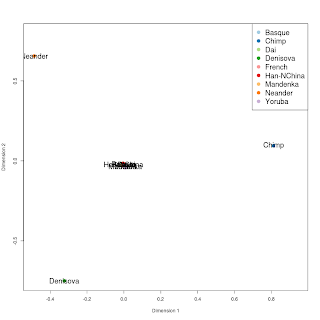 I carried out this analysis using all SNPs in panel 4, as well as SNPs with minor allele frequency less than 10% in French, Dai, Yoruba, and MbutiPygmy. 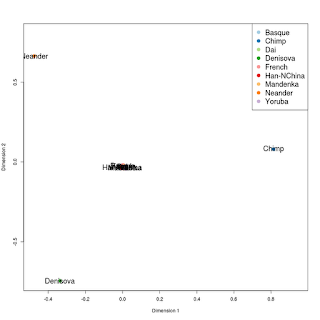 While the authors chose to limit themselves to low-frequency SNPs in French, I chose to do the same with low-frequency SNPs in Africans. The full results can be seen at the end of this post. It turns out that the "Neandertal admixture" signal persists even in the class of SNPs with MAF less than 10% in the Yoruba and MbutiPygmy. If these SNPs are of Neandertal origin, then their presence in Africa indicates substantial back-migration from Eurasia, which introduced them into West Africa. If these SNPs are not of Neandertal origin, then their presence in Africa indicates archaic African admixture that has shifted West Africans away from the common ancestor of modern humans and Neandertals, and a structured African population. 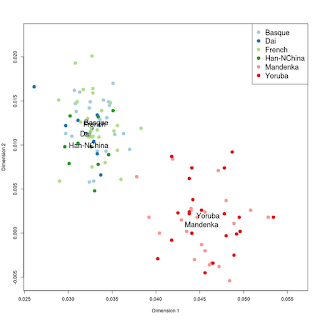 I have argued for both Eurasian back-migration into Africa and African population structure. What does not appear to be tenable is a model which simultaneously (i) dismisses Eurasian back-migration into Africa, and (ii) dismisses African population structure as a possible explanation for the observation of greater Neandertal-Eurasian than Neandertal-African similarity. UPDATE: The complete set of population means for the above experiments can be found in this spreadsheet. UPDATE II: Even stronger evidence in a newer post. 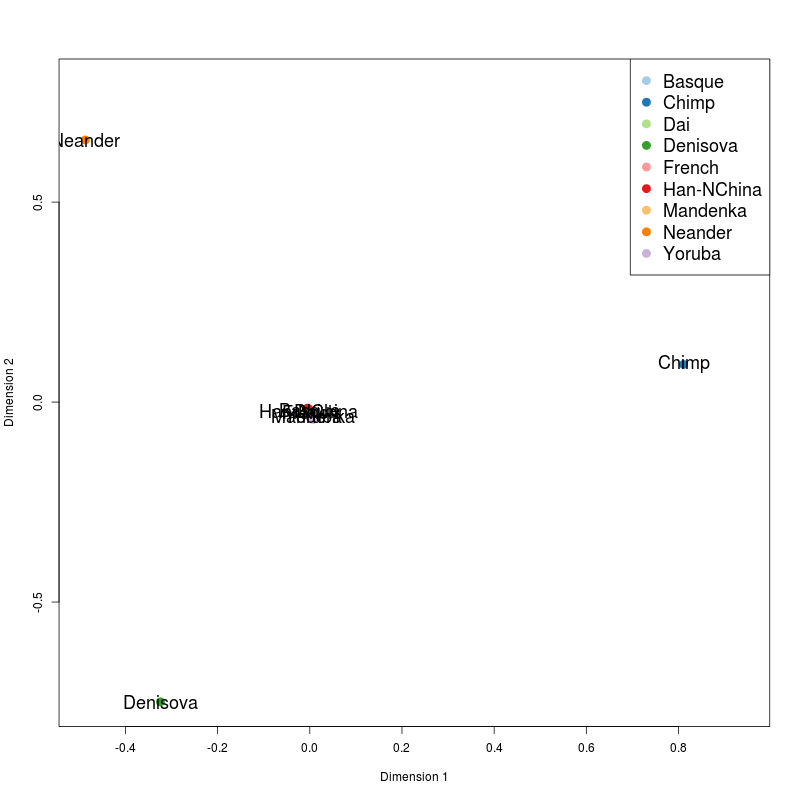 "It turns out that the "Neandertal admixture" signal persists even in the class of SNPs with MAF less than 10% in the Yoruba and MbutiPygmy." What about San? Does it persist in San as well? Yes, but since the panel I used was ascertained in a San individual, so it's probably biased to polymorphism present in that population. 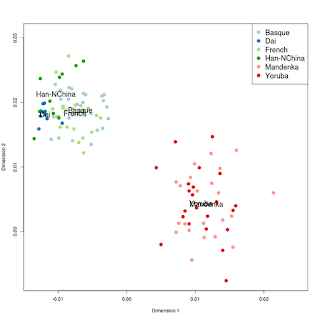 On the other hand, the fact that there are low-frequency SNPs in Europeans with Neandertal admixture that are also present in San argues against them being recent Eurasian introgression that is absent in San. Anyway you slice it, African population structure matters. Sankararaman et al. 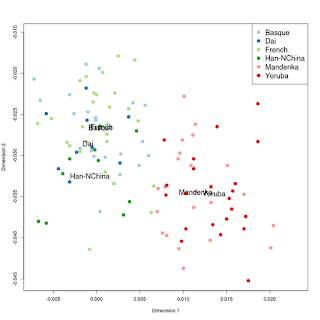 (2012) includes models of African population structure in their simulations. They certainly don't dismiss it. 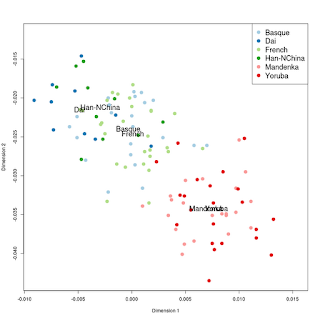 In table 2 they have generation times since admixture for the various models. Population structure increases the time estimate and their upper bound is at 86,000, which is getting pretty close to Skhul and Qafzeh. Remember they are estimating most recent so there could of been 2 events for Europeans. I'd bet that the calculation for East asians places it right at Skhul and Qafzeh. As far as I can tell, they only work with SNPs with MAF less than 0.1 in French. 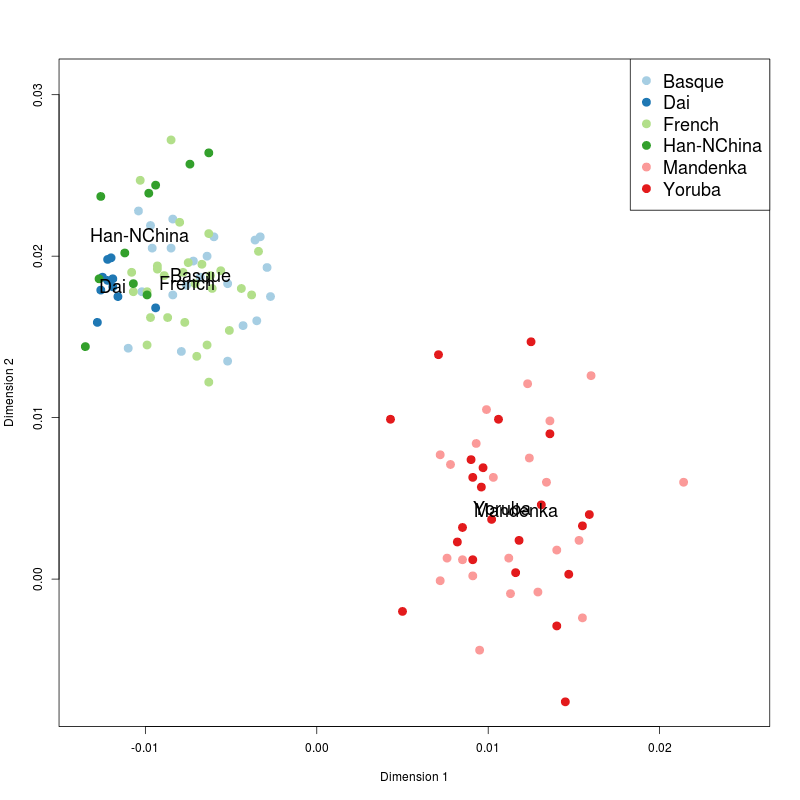 If archaic SNPs introgressed into Africans, they'd have low MAF in Africans, which is what I tried to do here. 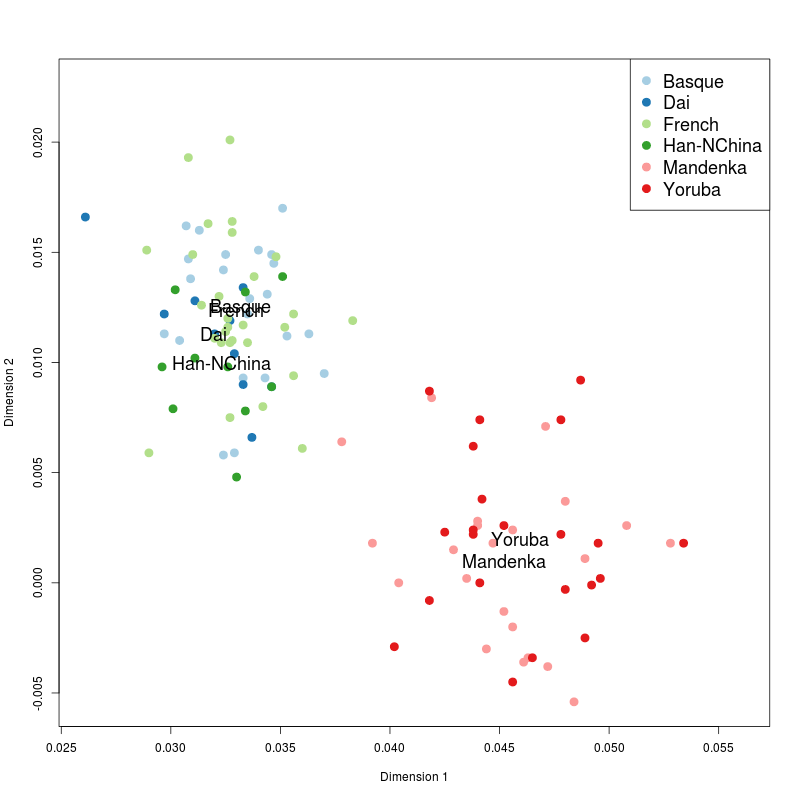 "On the other hand, the fact that there are low-frequency SNPs in Europeans with Neandertal admixture that are also present in San argues against them being recent Eurasian introgression that is absent in San. Anyway you slice it, African population structure matters." 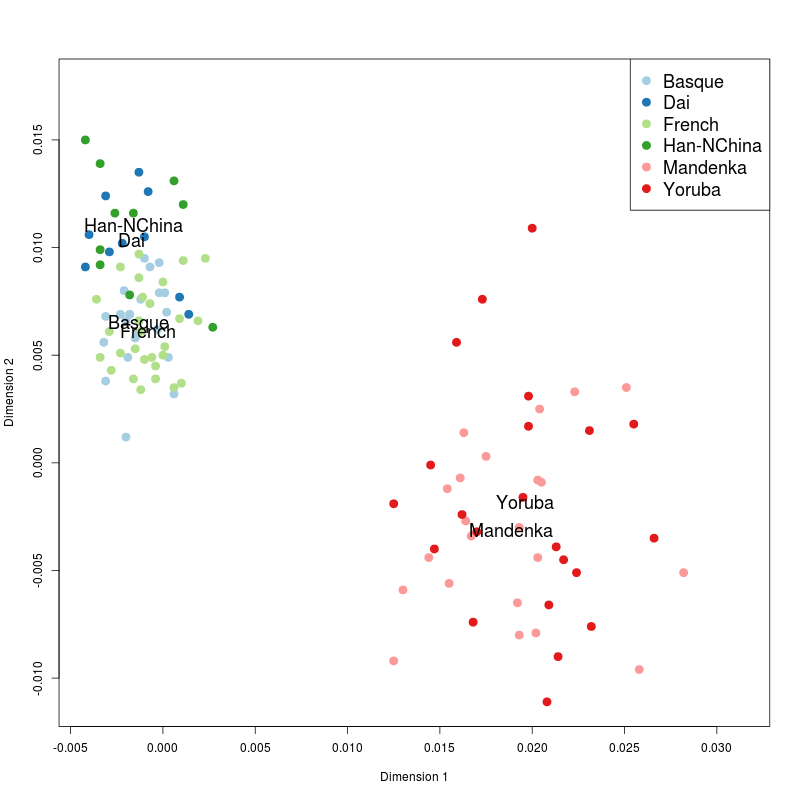 Why not a migration of Eurasians carrying Neandertal alleles into Africa with subsequent greater loss of Neandertal alleles in Africa than outside of Africa? 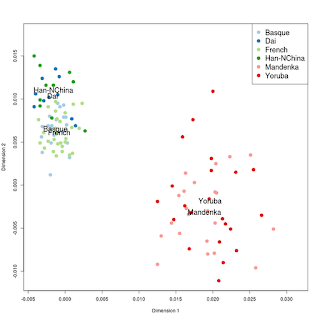 "Why not a migration of Eurasians carrying Neandertal alleles into Africa with subsequent greater loss of Neandertal alleles in Africa than outside of Africa?" That does not fit the Occam's razor rule. It requires too many complications.